Mobile Student Chairs Add Color To Your Classroom And Offer Color-Coding Opportunities For Learning Stations And More. They Are Equipped With Swivel Casters For Extra Mobility In A Classroom, Computer Lab Or Office Setting. The Four-Leg Base Features The Strength Of Heavy-Gauge Tubular Steel With A Chrome Finish. Smooth Polypropylene Shell Allows Easy Cleaning. Contoured Waterfall Seat Front Offers Comfort. Chairs Stack Five High For Convenient Storage. 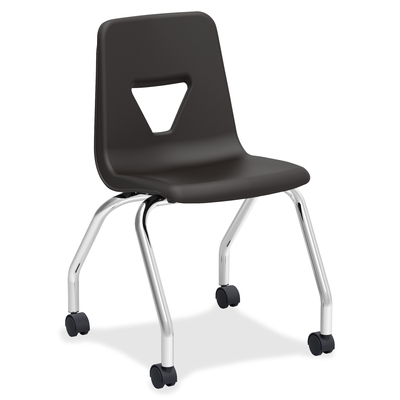 Seat Height Is 18" And Is Typically Designed For Students In Fifth-Grade And Up.. Mobile Student Chairs Add Color To Your Classroom And Offer Color-Coding Opportunities For Learning Stations And More. They Are Equipped With Swivel Casters For Extra Mobility In A Classroom, Computer Lab Or Office Setting. The Four-Leg Base Features The Strength Of Heavy-Gauge Tubular Steel With A Chrome Finish. Smooth Polypropylene Shell Allows Easy Cleaning. Contoured Waterfall Seat Front Offers Comfort. Chairs Stack Five High For Convenient Storage. Seat Height Is 18" And Is Typically Designed For Students In Fifth-Grade And Up.